Trey of Sorcerer's Skull has put out another book, though not the long awaited follow-up to his pulp/fantasy 1920's Americana setting book Weird Adventures. While Trey's most recent book is system agnostic, even more so than Weird Adventures, it is a sci-fi setting book, much larger in scope then Weird Adventures that offers a combination of pulp Buck Roger's style Space Opera and more contemporary post human sci-fi - something a bit like Glenn Cook's "Dragon Never Sleeps" or the Culture novels of Iain M. Banks. 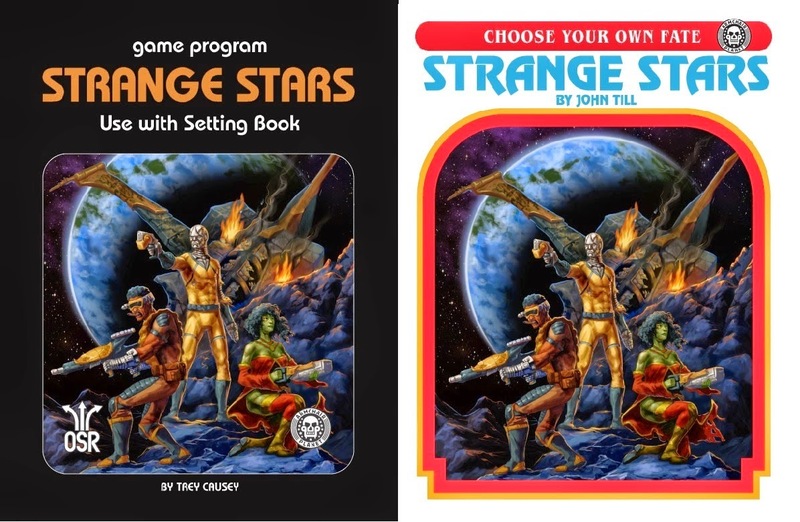 There appear to be plans to release some likely free rules for Strange Stars using both FATE (written by John Till of FateSf) and Stars Without Numbers, which is my personal favorite OSR sci-fi ruleset (it's a B/X mod, and very excellent). As a product Strange Stars maintains a very high quality, with a great deal of excellent art (so much that it sometimes overwhelms the writing), good design and a very polished appearance uncommon in small press or solo publications. The content within provides a sweeping view of a game universe that is a standard enough science fiction setting, with some interesting tweaks and changes. Nothing as bold as Weird Adventures, but then the fictional ground of galaxy sprawling space opera is a lot more well-trodden then that of 20's fantasy pulp (which I think is limited to the Silver John stories by Wade-Wellman). With this Constraint does a good job and is a fun read, though I wish it was a little less overarching and a little more narrowly focused on adventuring within the Strange Stars. At the heart Strange Stars is a gazetteer, though not in a detail oriented manner that lists trade goods and populations. The book lays out outlines for cultures scattered about in a mostly post-human space, provides a sense of history where the possibilities for adventure includes both ancient wreck hunting and space mafia schemes. Luceat Lux Vestra - Making Light Management More Interesting in Old School Games. 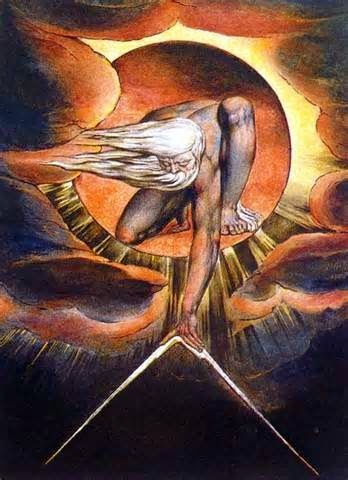 In the dark gulfs beneath the earth, the ancient places where thick darkness wells up a hungry oil of ebon malice the greatest weapon of the brave explorer is not sword or axe, but light. Each guttering torch and cheap tin lantern is a tiny fragment from the world above, a piece of the sun. Without light the soft creatures of the overworld have no hope; the sharpest blade cannot cut the horror it doesn't see, and the stealthiest pilferer cannot find the bright gold and jewels concealed in the gloom without a telltale glimmer. Looking through the old 1974-79 edition of Dungeons and Dragons (Original D&D or The Little Brown Books) one finds an interesting passage about dungeon exploration on Underworld Adventures, page 9 about lighting and surprise. A pair of short paragraphs are the only mention of how light works as a rules mechanic in the Little Brown Books, though torches, lanterns and oil flasks are mentioned as items for purchase (though without a given encumbrance weight). "In the underworld some light source or infravision spell must be used. Torches, lanterns and magic swords will illuminate the way, but they also allow monsters to "see" the users so that monsters will never be surprised unless coming through a door. Also, torches can be blown out by a strong gust of wind. Monsters are assumed to have permanent infravision as long as they are not serving some character." Underworld Adventures, Page 9, Gygax & Arneson (1979). A second short paragraph reiterates the surprise rules a bit down the page. These rules are interesting in that they assert a necessity of light sources for dungeon exploration, assume infravision is a spell (and so a limited resource) and radically change the way encounters run in the underworld, because the party cannot surprise its enemies unless they are opening a door, and monsters still have the 1/3 chance of surprising the party. When getting the drop on explorers monsters will almost always attack under these rules so light sources balance out the relatively generous reaction roll table. Yet these rules don't discuss visibility range, light source exhaustion or anything else beyond how light effects the denizens of the depths. However the rules in Underworld Adventures do remind the reader that light works as a two way interaction, the underworld can see well illuminated players long before the players can see the creatures of the depths. I am not really that beholden to old school D&D, and there's plenty of good ideas about how to run tabletop games that have come along in the past forty years and expand on the sparse and clumsy beginnings. One game that I don't especially love (though I've only played it once) was Torchbearer, my complaints were with the implicitly vanilla fantasy world that seemed baked into some of the rules, and the Storygame tendency to reduce player creativity and problem solving to simplistic min-maxing mechanics through a bonus stacking system. Yet, Torchbearer has some neat rules about supply and resource exhaustion, with abstract turns that rapidly eat up light resources and clear status effects as a result of being lost in the darkness. Building off these ideas, some members of the online old school game community (principally Brendan over at Necropraxis) have come up with an expanded Random Encounter die that I like to call an Exploration Die, and that includes not only the chance to encounter wandering monsters or environmental hazards, but acts as a random check for resource exhaustion (light, hunger and long-term spell effects). This has the advantage of removing time tracking as a burden on the GM, and I find it both useful and fun in a less heroic fantasy setting. A strict encumbrance system based of significant items slots (number of items carried is equal to character strength) helps make the choice of what equipment to big into the dungeon meaningful, as taking one item usually requires leaving another behind. This means that the decision to bring enough torches or lanterns is a meaningful one, and that there is a possibility of exhausting a party's light supply even in a short session. Additionally, equipment will need to be abandoned to make room for treasures. These rules also have the advantage of being harder to misuse then a weight based system, and are much much simpler to track.